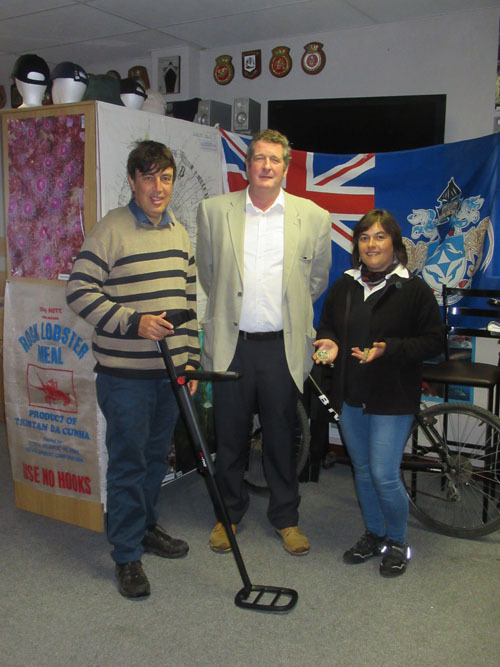 News about Tristan da Cunha's facilities and attractions for tourists and visitors. My name is Gan Erez and I am from Tel Aviv in Israel. In my office in Tel Aviv I have a big and colourful world map hanging on the wall and every now and then I look at the map, find an interesting island somewhere in the world and then read about it on the internet. 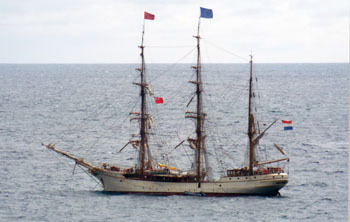 One day about seven years ago I found Tristan Da Cunha on the map and then started reading about it. 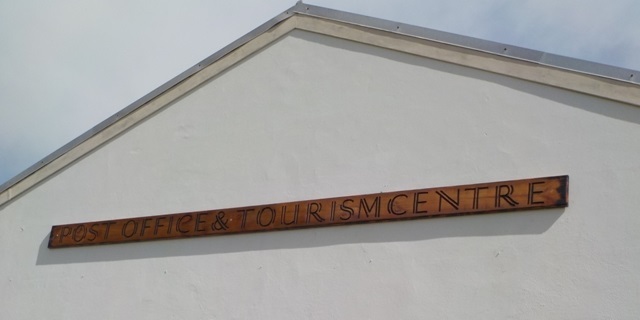 I absolutely fell in love with the place and kept reading and watching anything I could find about it and at the same time started dreaming of one day visiting the island. A year and a half ago my partner and I were on a holiday in Milan Italy, one evening my partner went to sleep early after a long day of sightseeing and I stayed awake and connected to the hotel's Wi-Fi and started just reading different articles on Israel's main news website. Suddenly I saw an advertisement about a competition held by Israel's biggest travel agency called the Geographical Company. They were challenging their readers to tell them about an unknown destination, some special dream place on our planet that nobody has ever heard of. 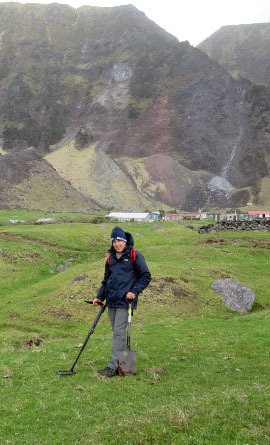 Luckily for me my story about Tristan Da Cunha won the first prize out of 3000 participants and so they generously paid for my trip to Tristan all expenses paid. I then got in touch with the island, took care of all the formalities and eventually got a berth on the ship Edinburgh that left Cape Town for Tristan on September 12th, 2018. The trip took 7 days on seas sometimes rough and sometimes fairly quiet and every day that past by I got more and more excited about the idea that soon I will really be there. When we arrived at Tristan, I couldn't believe that I was actually there. I just couldn't believe my eyes and I was so very happy. 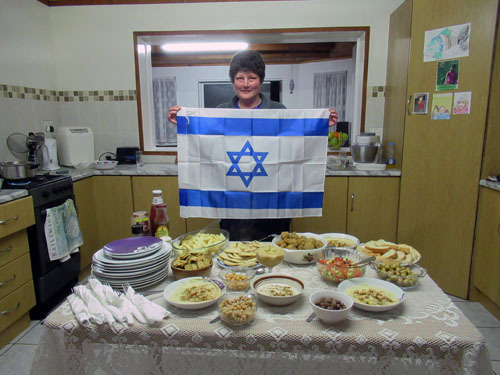 Lillie with an Israeli flag and on the table special Israeli dinner dishes that Gan prepared for her and her family. I stayed on the island 16 days with Cliff and Lillie Swain. They are an amazing family that really looked after me, took care of all my needs and cooked for me delicious food. They truly made me feel very welcome and so much at home. 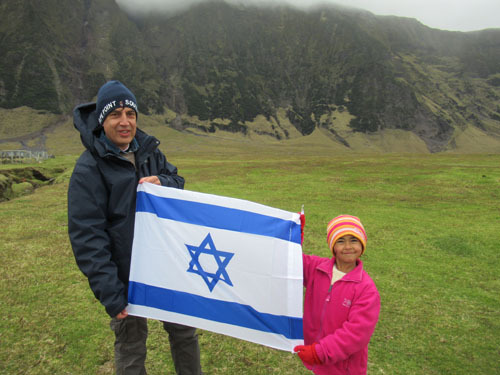 Gan's Israeli Flag shared with a young islander. 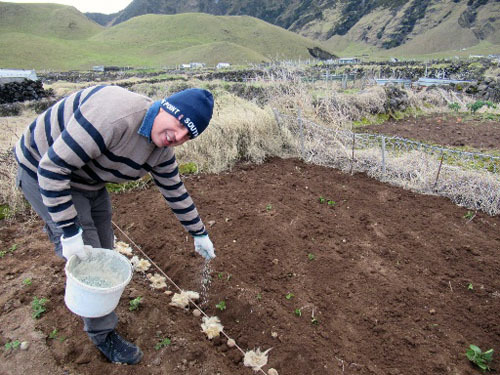 Gan entering into the community by helping to plant Swain family potatoes. 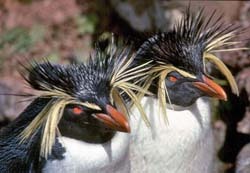 I even got a chance to visit the neighbouring island of Nightingale which was absolutely breath-taking and coming face to face with penguins, seals and yellow nosed albatrosses was one of the most amazing moments of my life. 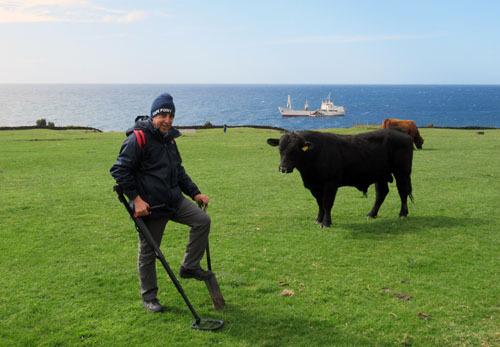 Gan out and about with his metal detector. and everybody looked out for him to say hello. 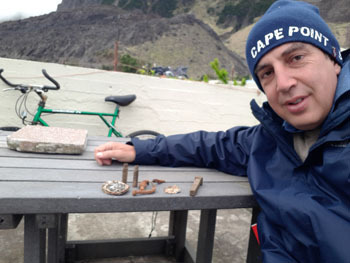 As my personal hobby and profession is metal detecting, I brought along with me a brand-new metal detector which I used to search for interesting artefacts left behind by early settlers. 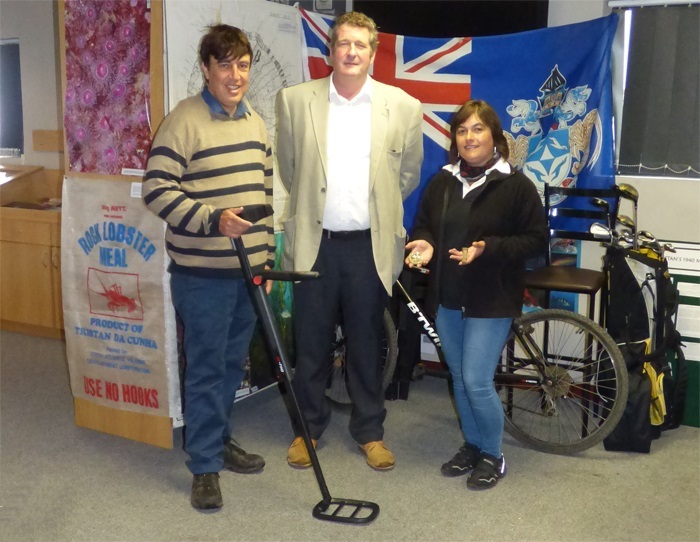 I did manage to find a few nice things which I handed over to the local museum, and before leaving for home I donated the metal detector to the islanders as a gift to the island from the people of Israel. 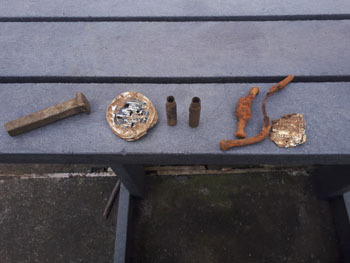 Gan with some of the finds made with his metal detector, shown is close-up right. some unknown metal object with English writing on it. 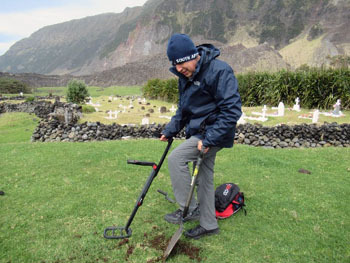 Another interesting thing that I did on the island was teaching the younger school children how to use a metal detector and the children had a great time finding coins that I hid for them in the field right next to their school. Gan showing school children his metal detector. I also gave a presentation about my country to the older local school children and showed them different photos from my country including famous biblical places like Jerusalem, Bethlehem and Nazareth. 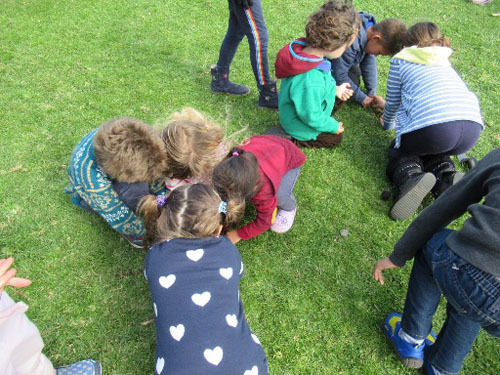 Children examining finds from a metal detector search - hoping for treasure! The people of Tristan were the kindest and friendliest people you could ever meet in your life. Absolutely wonderful people with a very warm and loving heart and I enjoyed meeting them so much and even had a long conversation with uncle Harold Green who invited me to his house and told me fascinating stories about his life on the island. 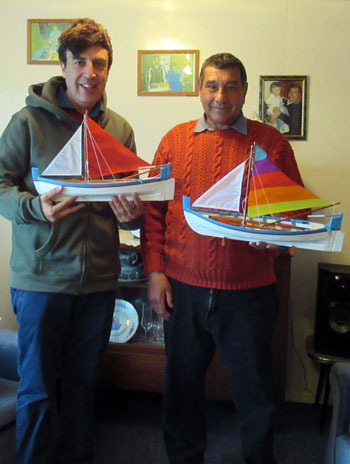 I must say that I learned from the islanders many things about the good of mankind along with rich family and human values and I already started implementing everything I learned to my children as soon as I got back home. 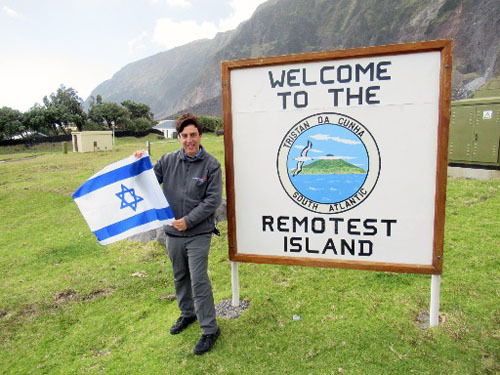 It was also a great honour for me to be the first ever Israeli visitor on Tristan da Cunha as never before anyone from my country has ever visited the island and ever since I got back home people here have been wanting me to tell them all about my trip. In November I was interviewed about Tristan on the Israeli TV then gave a presentation about Tristan to over a hundred people and there are a few more presentations to come. and Head of Toursim Dawn Repetto. Gan donated his metal detector to the island. I will never forget this beautiful island with its breath-taking landscape and amazing people, there is definitely no other place like it in the world. I Iook forward to keeping in touch with the island and visiting it again one day with my two children. 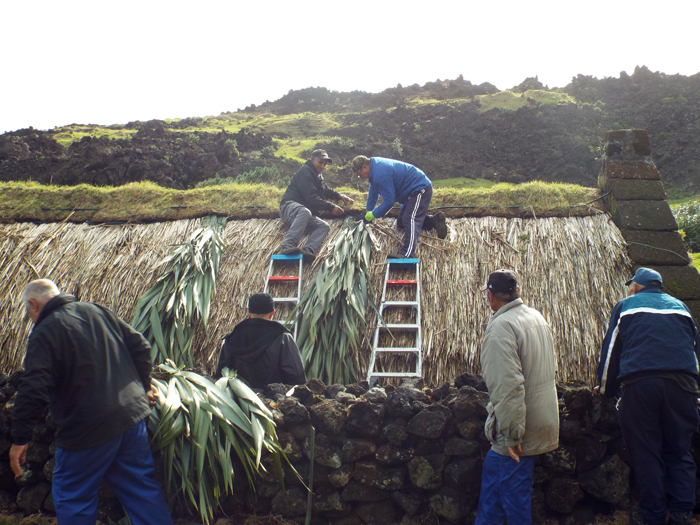 The roof of the Thatched House Museum needed repairing after winter damage. 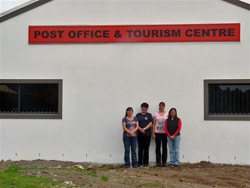 A new outdoor sign has been made for the Post Office and Tourism Centre local craftman Larry Swain. 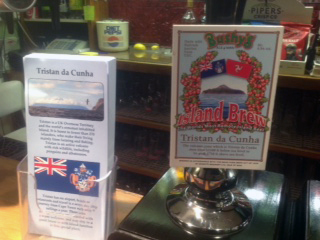 Bushy's 'Island Brew' infused with Tristan Island Berries goes on sale in Horsington on the 2nd December 2016. 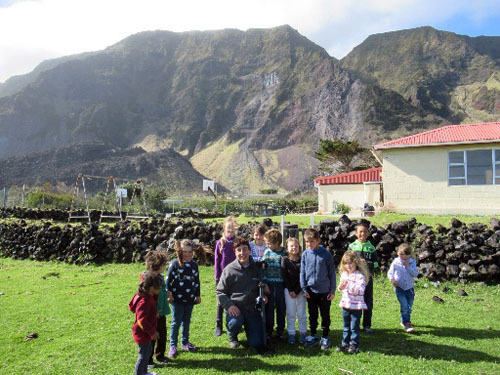 Tristan da Cunha has established a number of attractions with visitors and tourists in mind.